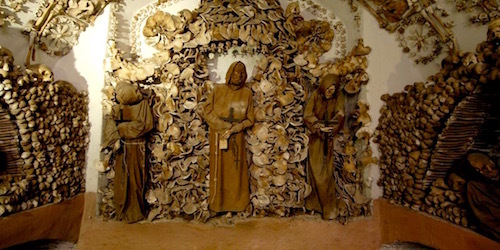 When we went to Rome several years ago, we visited the Capuchin Crypt located on the Via Venato. 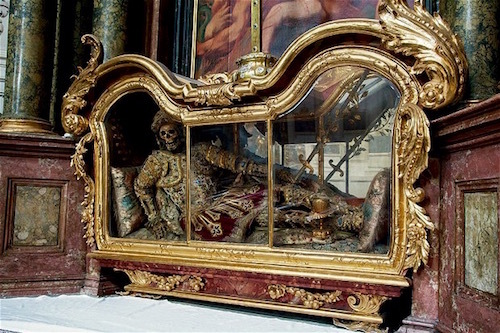 Every bit of the six-room little space is adorned with the dismembered skeletal remains of c. 3,700 monks who lived, died, were allowed to decay to bones after which the bones were “artistically” arranged all over the walls of the small chapel. The monks had moved to that chapel in 1631 carting with them 300 loads of old bones from their previous friars. Along with their previous brothers’ bones, the friars who carted the bones and began the “artful” arrangements would in time became parts of the, what some would call, ingenious, macabre motif. 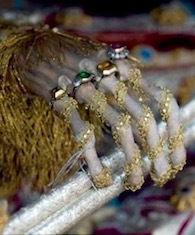 Do you, the reader, consider this image of a skeleton decorated with jewelry macabre or beautiful or ingenious? Apparently many Catholic believers during the period of the Reformation (1517-1628) felt they were beautiful, worthy of veneration or even heavenly intercession for believers. The Catholic Church was on the offensive since the Catholic priest Luther tacked up his 95 Theses to the door of All Saints’ Church in Wittenberg, Germany in 1517. The Theses condemned the Catholic Church’s selling of indulgences for sin and other non-Biblical practices. There were many protests by Protest-ants against the Church’s corruptions all over Europe. 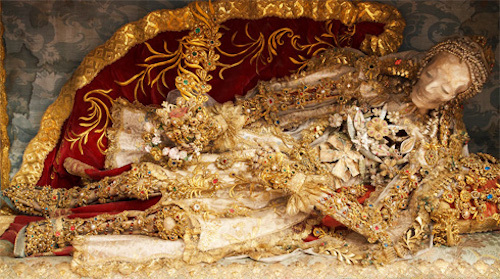 The plethora of catacomb bones of real or supposed martyrs in the 1600’s was a gift to the Catholic Church because the perfectly articulated corpses held many Catholics enthralled. 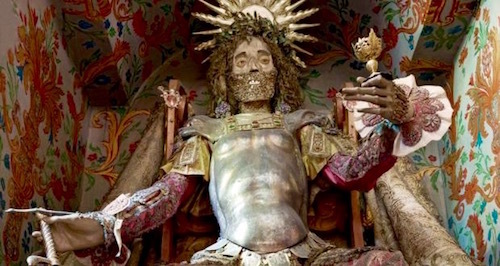 There were pilgrimages to Catholic churches to see these fantastically arrayed martyrs. 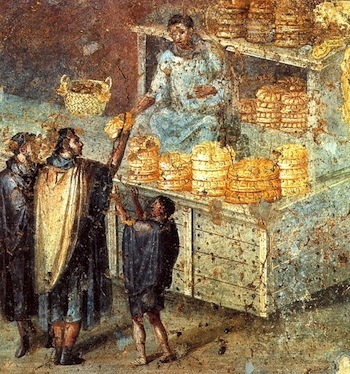 The bones themselves came from the re-discovery of the Roman catacombs in c. 1578 when local workers at a vineyard on the Via Salaria in Rome found a hollow, followed it and re-found a catacomb. 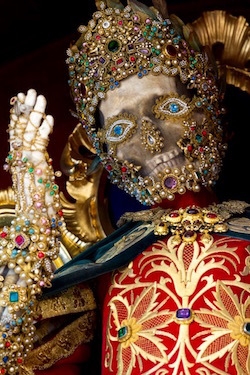 For the next many decades those underground catacombs were found, were plundered by grave robbers and the bones, skeletons, clavicles et al were sold as relics of martyrs to various Catholic churches. 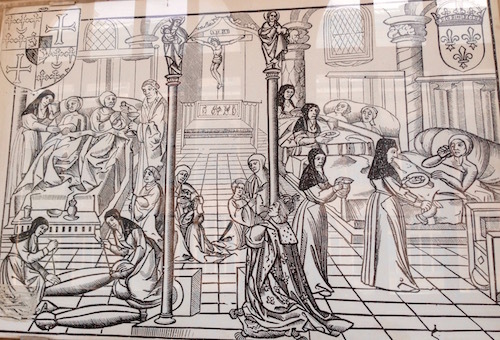 The tireless, empathetic nuns connected to those churches were very talented women and are the ones who made the clothes for and placed the precious and cut stones for decoration upon the catacomb bare bones (called in German katakombenheiligen). Who knows whose ancient bones were so festooned. The bones came packaged from Rome with the name of the martyred saint on the package. There are actually martyrs with names like St. Incognitus, St. Anonymous, St. Innominabilus (Latin “unnamed”). Wonder how many pilgrims/lay parish priests knew enough Latin to know how ironic these names were when applied to a bag of plundered bones. Is this really the hand of a St. Valentin? 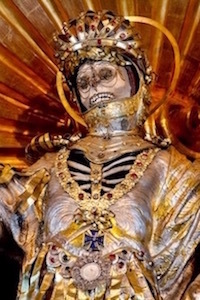 Are these really the ancient bones of a woman named St. Luciana (below)? There is a man in 670 AD who was called St. Deodatus, the hermit. He was bishop of the church in Nevers, France. 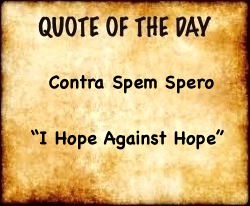 He died a natural death almost 400 years after the persecutions and martyrs in the Early Church. But he was regally “articulated” (bones put back together) anyway. Is that really the bones of the hermit (below)? St. Theodosius (died c. 529) almost rises to greet us at the church in Waldessau, Germany (below). Even though the real Theodosius founded a church and did not die a martyr’s death, his name is affixed to this supposed earlier martyr Theodosius. Maybe there was an unknown man named Theodosius, meaning “giving to God,” who was martyred for Christ in, say, the early 300’s under the Diocletian persecution? But the known St. Theodosius in the 500’s is one of 10,000 saints venerated by the Catholic Church.